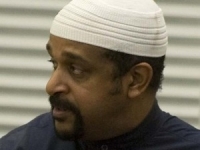 Supporters of Hamas, Hezbollah, Boycott, Divestment, and Sanctions Movement to Speak at Muslim Student Union-Sponsored "Palestine Liberation Week"
On Tuesday, May 8, anti-Semitic Oakland imam Amir Abdel Malik Ali will speak. In 2010, Malik Ali answered "yes" when asked if he supported the terrorist groups Hamas, Hezbollah, and Islamic Jihad. It gives the impression that Zionism is like, it's okay, that it's okay. Now, you Jews, in all due respect, you wouldn't sit down with Nazis for tea and cake. No you wouldn't! · Boasts that, "The enemies of Islam know that when we come back to power we're gonna check 'em." · Claims that, "[T]he Israelis were in control of 9-11," which "was staged to give an excuse to wage war against Muslims around the world." · Insists that Israelis ought to return, "to Germany, to Poland, to Russia. The Germans should hook y'all up. You [Israelis] should go back to Germany." · Predicts that, "When it's all over, the only one standing is gonna be us [Muslims]." This week's other scheduled speakers further confirm the event as an anti-Israel propaganda fest. We will be filing daily reports on the events. Monday, May 7: Ben White, an ardent supporter of the Boycott/Divestment/Sanction (BDS) movement who regularly contributes to such radical-left publications as the Electronic Intifada, the Guardian's Comment Is Free blog, and the New Statesman, offers a "Beginner's Guide" to Israeli "apartheid" and on "Shattering Israel's Image of Democracy." Wednesday, May 9: Hatem Bazian speaks Wednesday evening. The UC Berkeley senior lecturer is an endorser of the Israel Divestment Campaign, a signatory to the U.S. Campaign for the Academic and Cultural Boycott of Israel, and a committed anti-Israel propagandist and activist. In 2011, Bazian participated in the "Never Again for Anyone" campaign, which coincided with International Holocaust Remembrance Day. Its purpose: to draw a connection between the Holocaust and the Arab-Israeli conflict, with Israelis cast as the new Nazis and "Never Again" transformed into the Palestinian rallying cry. Thursday, May 10: Osama Shabaik, one of the "Irvine 11," speaks at noon; that evening, other members of the group convicted of conspiracy to disturb a lawful meeting and the disturbance of the meeting are featured. Eleven of the radical group's members or friends were convicted in 2011 for disrupting Israeli Ambassador Michael Oren's lecture. As a result, UCI banned the MSU for a quarter and placed on probation for two years.